Netgear has a new router and LAN switch aimed at gamers, along with software to keep you from buffering. Jeffrey Powers talks with Netgear at CES about all the cool new products, including the XR500 gaming router and XS10 Gaming switch. Why a Nighthawk Gaming Router? Because when you are in the middle of a heated battle, you don’t want any connection problems. The Nighthawk Pro Gaming XR500 router and the Nighthawk SX10 10G/Multi-Gig LAN Switch help optimize network connections, stabilize ping, reduce lag, and generally make sure that you are ‘always-on’ both on wired and wireless connections while playing online games. Otherwise you may find yourself in a fit of rage when bad things happen just as you are beating that boss monster. Netgear has partnered up with NetDuma for the DumaOS – software that can limit your location to other gamers, along with allocate bandwidth for others who might be watching movies, playing games, or other tasks. The team at Netgear show Jeff how to localize his gaming experience, find out which devices are taking up all the bandwidth, and adjust allowances so one program doesn’t start causing bottlenecks. 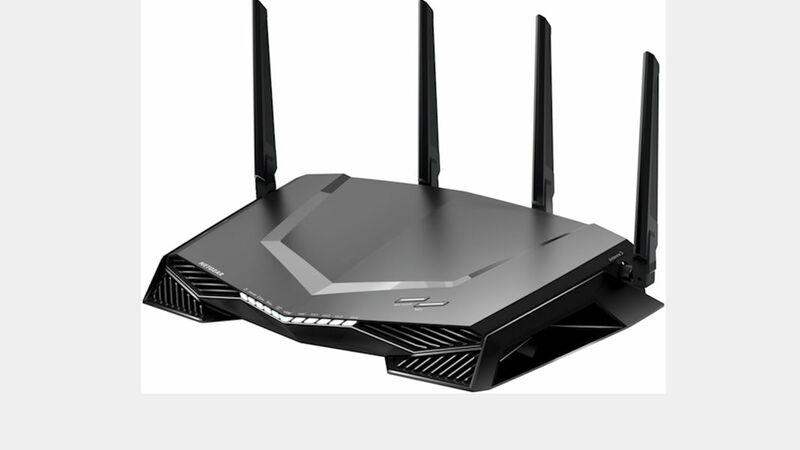 The Nighthawk Pro Gaming WiFi Router is going to be a gamer’s best friend. This device has a dual-core 1.7GHz processor, Quad-stream Wave 2 Wi-Fi with MU-MIMO, and four external high-power antennas. There’s also a four-port Gigabit switch for wired connections. Rounding things out are two USB 3.0 ports to share USB storage. It also packs in 256MB flash storage and 512MB of RAM. The Netgear Nighthawk Pro Gaming SX10 10G/Multi-Gig LAN Switch offers hard-wired speeds and has two auto-adaptive 10Gigabit/Multi-Gigabit ports that deliver data transfer rates speeds of 100Mbps, 1Gbps, 2.5Gbps, 5Gbps or 10Gbps. The Netgear Nighthawk Pro Gaming WiFi Router is priced at $299.99 and the Netgear Nighthawk Pro Gaming SX10 10G/Multi-Gig LAN Switch shares the same price. Get the Nighthawk here.